Looking to teach a different play? 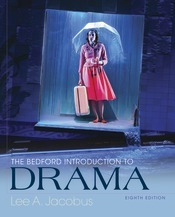 Trade Up and Save 50% Get 50% off any Macmillan trade book (including prize-winning contemporary plays) when you package it with The Bedford Introduction to Drama. To learn more visit: macmillanlearning.com/tradeup for a complete listing of offerings from our trade affiliates, including works from Henry Holt and Farrar, Straus & Giroux.